Police Scotland have paused the rollout of “cyber kiosks” which harvest data from mobile phones and laptops after concerns were raised about whether using the technology could be illegal. The force had been scheduled to introduce 41 “cyber kiosks”, which can override passwords, next month. The technology can rapidly search electronic devices for data to help speed up police investigations. Despite training hundreds of officers to use the digital forensics system, Police Scotland yesterday agreed to delay putting them into operational use pending advice from the Crown Office, Scotland’s prosecution service. It is possible to find more private information in a mobile phone than in a bedroom or a house. The decision came as the Scottish Human Rights Commission, the Faculty of Advocates, and the Information Commissioner all demanded that the introduction of the devices be shelved pending a full inquiry. The cyber kiosk can override passwords to access private data such as text messages, photos, contacts, encrypted conversations, web browsing history, and call history. Police Scotland has already spent £370,000 on the kiosks. The force insists that it has the right to view private data under current legislation. However, other stakeholder groups believe that new legislation is needed. Concerns have been raised about the right to privacy, the type of personal data that can be accessed, the legal basis for accessing it, and arrangements for data security. Privacy is a fundamental human right. Under the Human Rights Convention, the right to privacy is, in effect, contained in Article 8, the right to respect for family and private life. It is important to remember that it is also a “qualified” right. That means it is not absolute, and can be interfered with in certain limited situations, for example to protect national security or freedom of expression.However, any interference has to be necessary and proportionate. 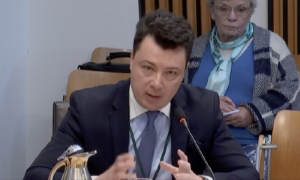 Diego Quiroz from the Scottish Human Rights Commission told Scottish parliament’s justice subcommittee on policing that conducting a search of electronic devices should be on a par with a physical search of a property. He said: “We know that cyber kiosks can access private data – everything from texts to photos and web browsing – and even more sensitive data, such as biometric data. My phone has my fingerprints and my voice, for example. “In a criminal law context, there can even be information about journalistic material or legally privileged information. Yesterday, MSP John Finnie who convenes the justice subcommittee on policing, said it was “surprising and disappointing” that six months after the initial request, the legal basis for using cyber kiosks still had not been shown to the subcommittee. Police Scotland said the matter was complex. View all posts by Dulcie Lee.